I am happy to announce that the first launch of my project ‘acoustic identity’ has been successfully realised. 14 kids from madagascar’s capitol antananarivo worked with maria weber, me and our interpreter yannick for twelve days, collecting audio- and videomaterial that represents madagascar’s unique culture. A culture that has been heavily suppressed during the french colonalisation period and christianisation. The collected material (more than 12 hours of video and audiomaterial) reveals madagascar’s diversity, it’s host of impacts, visual, acoustic and physical, which throw you of balance, and both oppress and enchant you. The material offers a direct and realistic approach to the life and culture in it’s purest form. Safidy, Yannick Rakotomanana, Dolly Ramatimanana, Nathalie Ramasinana, Stephanie Rabenja, Valerie Rabearisona, Koloina Andriambololona, Gracia Andriambololona, Patricky Rabearisona, Tsanta Raharijaona. Die Installation “How far is 12cm?” von Brigitta Bödenauer und Peter Kutin möchte stille Konstanten sichtbar machen. Mehrere Super 8 Projektoren werden in unterschiedlicher Distanz zueinander positioniert. Ihr Licht trifft auf die ihnen gegenüberliegende Fläche. Die darauf befestigten Filmrollen bleiben leer; sie transportieren keine Inhalte mehr. Bewegliche Gegenstände tauchen zwischen Projektoren und Projektionsfläche auf, beginnen sich mit Schatten von Filmrollen zu überlagern und verschwinden wieder. Durch die geringfügigen Unregelmässigkeiten der Maschinen, und durch deren Präparation sind Licht und Ton fortwährend einem minimalen aber stetigen Änderungsprozess unterworfen. Die Tonebene generiert sich dabei aus der Lichtstärke. Die Projektoren verstummen jeweils nach 14 Minuten. Dies ist jene Zeitspanne, die eine Filmrolle von 12 cm Durchmesser in etwa transportieren kann. Eine minimierte Versuchsanordnungen fand bisher bei der VELAK-GALA (Konzerthaus, Wien) statt, eine installative Testversion gab es beim Reheat Festival 2011. Unterstützt wird das Projekt vom bmukk. with assistance of Matija Schellander I realized a sequel of my last years work ‘Umgebung – Winterleitensee / Composition for a mountainlake‘, following the conception of slowly developing a cycle. I wanted to do it in a city, in vienna. after some research and sound-walks I chose the huge construction site of vienna’s nordbahnhof as an appropriate location. a former train-station area that has been deconstructed during the last years, now leaving behind a huge flat field in northern vienna. it will be transformed into residential complexes within the next few years, the work starts slowly. this ’empty field’ is enclosed by the distant sounds from the city. For being in a city, we can hear unusually far. closer/near by, we hear trains passing , wind blowing , rabbits running , fireworks exploding in the distance; the grain-alike sound of frogs communicating with each other (resonant-impulses) emerges and repeats endlessly; the musicians play their separate parts, not hearing each other. each as if his/her sound belongs there. in the recording, each separately recorded channel fits into the whole soundscape, makes sense in a musical way. it was 23:30 (11:30 pm) when we started the ‘unofficial, unannounced, unsupported and probably forbidden performance & the recording’ which then lasted for 60 minutes. the recording was done in a high quality 4 channel technique, with large distances of the microphones (15-30m), allowing to rebuild a wide sonic field for acousmatic performances. it is a simple questionbut challenges many aspects of our listening-sense, about it’s ability to focus and to listen into distances. my compositions for certain environments deal with these factors. I am searching for environments which allow you to listen far away, as mentioned : into a distance. in most cases these are environments that seem to be ‘silent’. naturally, we will soon hear different and changing patterns of ‘noise’ (planes, wind, water, traffic, etc. ); it appears everywhere and if there is a place where you really hear nothing, you will hear yourself, your blood, your heartbeat and the like. there is no possible silence from the perspective of a physical definition. so what are silent places then ? places where just few acoustic signals can be heard ? We believe woods, mountains, seasides to be silent. But when we are there we will soon realize they are not. They are actually quite loud sometimes. We can use our ears to catch more of the overall sound as usual; in our everyday life’s, our ears are mostly busy with not hearing things – in order to protect our brain from an overload. maybe what we experience as silence are situations when our ears want to hear everything and don’t want to focus only on significant details. When standing in an open field i recognized an interesting function of – at least my – listening. it is as if our ears have a focal length, as we know it from camera-lenses. I can either listen concentrated to something i hear in a far distance, so the sounds closer to me will become more blurry, probably will be less analyzed by my brain – i focus on the distance. On the other hand I can switch and listen to the grass bending in the wind just 2 feet away from my ear. then the distant sounds will become blurry. this is when the question : ‘how far can you hear , how close can you listen ?’ came to my mind. For the musicians, which can hardly hear themselves when playing, experience and develop an unusual way of playing. They are asked to position their sounds due to the sound of the environment. On the recording, their interactions melt into an overall musical-action as if performed together, though they couldn’t hear each other. The environment transports the significance. 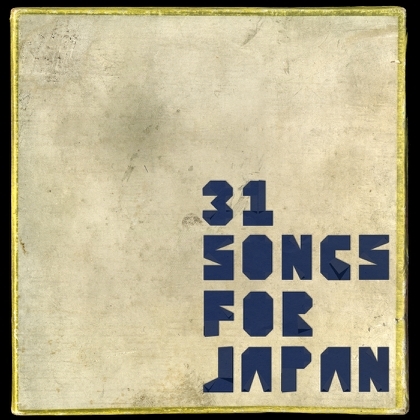 31 songs for japan was curated by yasuhiko fukuzono who is known for his project ‘aus’ and is running the label ‘flau‘ . 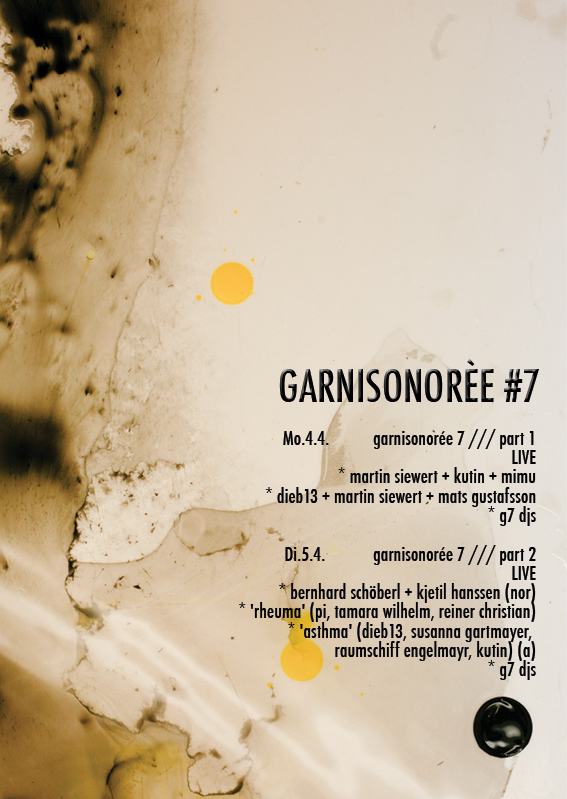 31 international artists (kirakira, sylvain chauveau, peter broderick and myself a.o. ) contributed some of their work in order to support the red cross’ actions in northern japan. CD comes within a grey cartoon package and is a limited edition of 240 pieces. drop bye if you are in vienna, afterwards celebrate 13 years of rhiz from 22:30 till ? ((audience)), Unsound Festival New York and EMF present “Cinema for the Ear” – a special five-channel surround-sound program with audio works composed around the theme of “Horror – the pleasure of fear and unease” by musicians including Clay Gold, Demdike Stare, Felix Kubin, Peter Kutin, Raime, and Rob Eggers.